DiveJobs - Internship - FREE PADI Scuba diving internship 2019 in Mykonos, Greece. FREE PADI Scuba diving internship 2019 in Mykonos, Greece. FREE Scuba diving internship 2019 in the beautiful island of Mykonos, Greece. We have 2/3 available spaces for our FREE PADI Dive Master Trainee Internship for the summer season 2019. If you have an outgoing, fun, loving personality and would like to become a professional diver take advantage of a unique opportunity and a lifetime experience! We offer FREE full training up to PADI Dive Master level, all course materials included, insurance plus free accommodation! In return we require your hard work and commitment to help maintain our dive centers excellent reputation and customer service. Applicants must be available to join our program around start of May, to start training and work with us until the end of the season (end of September/beginning of October). – Must be able to commit for a four-five (4-5) months period, working seven (7) days a week (day off depends on low-high season). All courses and training required becoming a PADI Divemaster (fees and materials are FREE of charge). Free accommodation with a shared room and supply of shared kitchen (refrigerator, silverware, cooking stove e.t.c. ), bathroom and wi-fi internet. Possibility to work full time with us after successful completion of the course and becoming part of godive Mykonos family for the next season. In our Dive Center GRADUALLY you will join to all Diving Trips, Snorkeling and Discover Scuba Diving while you will dive minimum 1-2 times every day and sometimes it could be more. You will have theory also in the afternoons. In return we require your hard work and commitment to help maintain our PADI Dive Center’s excellent reputation and customer service. Languages required: English (other spoken languages would be appreciate it). Please send your CV and a current photograph to: info@godivemykonos.com for more information and a Skype interview. Please share with your friends if you think that they might be interested!!! 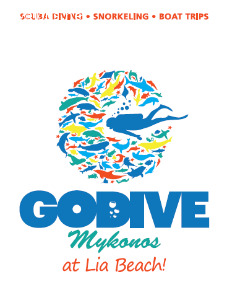 For more information’s please visit our web site: www.godivemykonos.com and our Facebook page https://www.facebook.com/MykonosDiving.